The key to making yummy ghee is to just dive in and practice a lot – each time it gets easier! Place a pound of organic unsalted butter in a saucepan and melt over medium-low heat. Maintain a gentle boil until the liquified butter becomes transparent. (The time depends on the pan and the level of heat, but it should be around 10 to 25 minutes.) Adjust the heat level so the boiling doesn’t feel frantic. The ghee will bubble and foam as it cooks down, and the solids will sink to the bottom. It is ready when: 1) it becomes transparent, and 2) when the sediment on the bottom turns a toasty light brown (which may or may not be visible depending on the type of pan you use – you may need to blow the foam aside to see). It also releases a distinct “buttered popcorn” smell when it’s done, which is slightly different from the scent when the butter first boils. Watch closely – when it’s almost done, it can burn quickly. 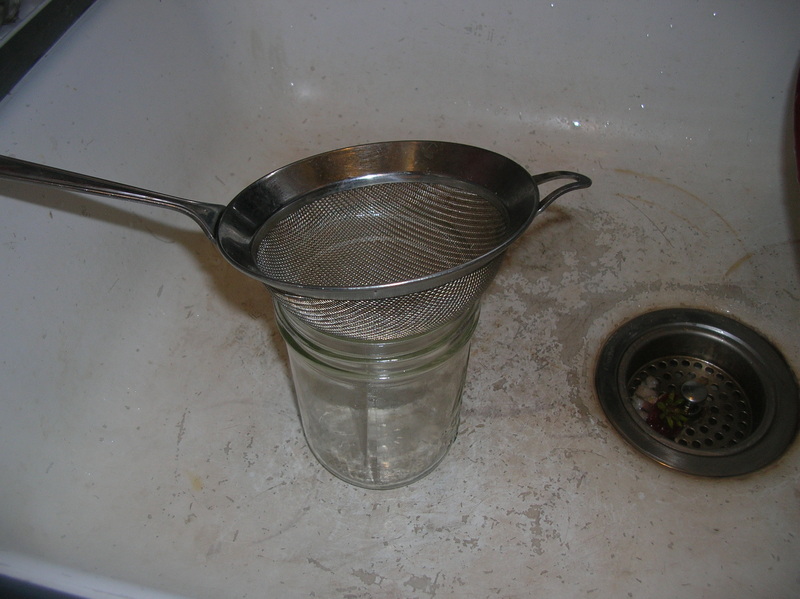 Pour the ghee through the sieve into the jar. Don’t remove any foam from the top – it’s good for you. The solids, however, are not – they should stick to the bottom of the pan, and any loose bits will be caught by the cheesecloth or sieve. 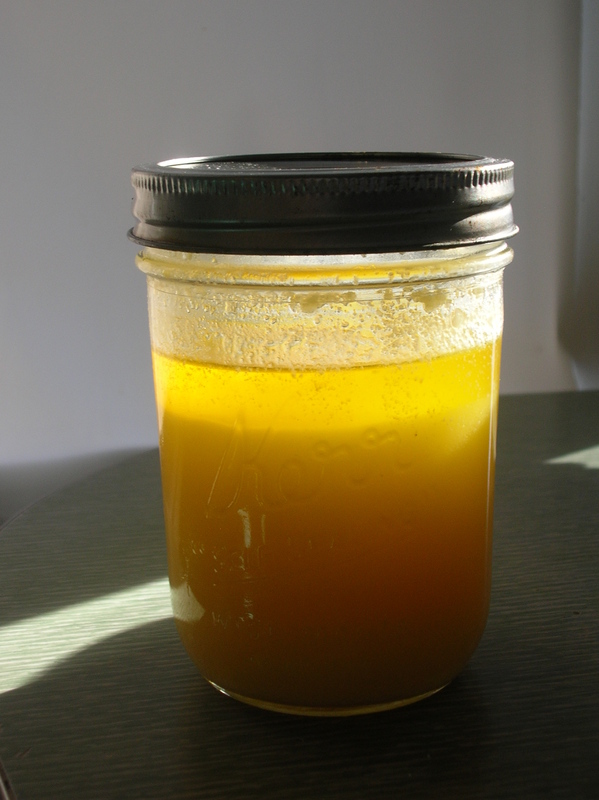 You can keep ghee in an air-tight container outside of the refrigerator without spoiling. Just make sure you use only clean utensils to remove the ghee so no food particles and no water get into the jar. The final product should be a golden yellow color. If it’s been cooked a little longer, it will be a dark amber while liquid and will set to a duller, slightly brown color. I happen to love the nutty taste of well-done ghee, although my teacher Dr. Lad calls it “burned” in this state. Experiment to find your preference!